How Far is Aditya Wiiz Lagoon? Aditya Wiiz Lagoon is 4-acre gated community that promises quality living in the midst of desirable features and recreation facilities. It is built for hard to please customers who expect a comfort lifestyle. When miyapur is meant for mundane and Kukatpally for the cluttered habitation, Nizampet emerged as the destination of discerning. 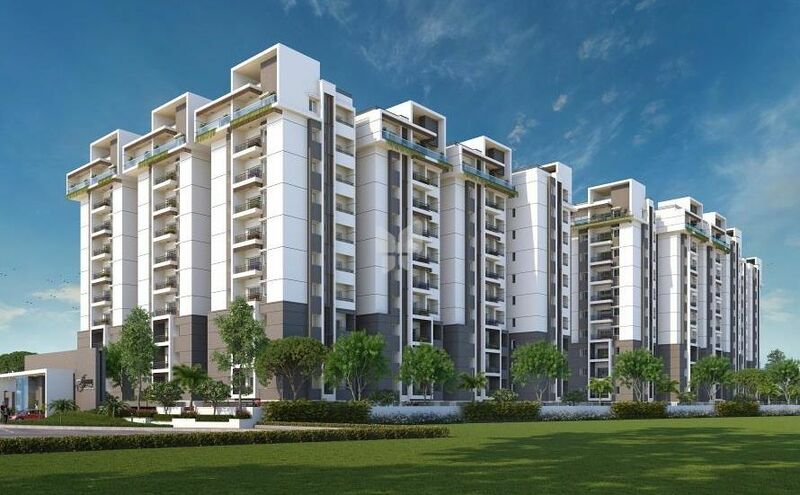 The location is of a great ambience with metro planning and spacious layouts. At a time when land is becoming scarce, Aditya Wiiz Lagoon spreads out 70% of the land to open spaces to its residents. Wake up to the sounds of water, birds and enjoy the magnificent views of lake and manicured outdoors. Aditya Wiiz Lagoon offers 290 two and three bedroom apartments in three 10 floor blocks with a range of delightful features. The elegant apartments offer flexible floor spaces to choose. Intelligent designs ensure functional spaces to provide for every need. Sunshine and natural breeze will refresh indoors.Strech in freedom and its's time to celebrate life moment by moment! Either it is social Interaction ,Recreation or staying fit, there is no place like your club house.Every moment at Aditya Wiiz Lagoon is as lively as it can be. Wake up and hit the jogging track for a few rounds of refreshing walk. Start your day energetically. Evenings invite you for a cool dip in swimming pool.Relax in meditation roomor absorb in a best seller at library. You will find multi-purpose hall with lawns a great place for hosting parties.Who could ask anything more in life. Internal - 15 mm thick double coat cement plastering with finish. External - 20 mm thick double sand faced coat cement plastering. Main door - m.t wood door frame and shutter aesthetically designed with melamine polish and hardware of reputed make. Internal doors - m.t wood door frame and flush door shutter with enamel paint and standard hard ware. Windows - upvc sliding plain glass shutter with elegantly designed m.s painted grills. French door - upvc sliding plain glass shutters. Internal - two coats of altek luppam finish over a coat of primer and two coats of plastic emulsion paint. External - combination of texture and luppam over a coat of primer and two coats of emulsion paint. Living, dining, all bed rooms & kitchen :vertified tiles (2’x2’) of reputed make. Toilets - anti skid tiles of of reputed make Sitout - rustic finish / mat finished tiles of reputed make Stair case, corridor & lift cladding:good quality of indian marble /kota stone /green marble flooring & cladding as per design. Parking & drive ways - v.d.f flooring as per design. Medium size wash basins of cera/ parry ware or equivalent make. Hot & cold mixer with over head shower of reputed make. E.w.c with flush tank of cera/ parry ware or equivalent make. All c.p fittings are crome plated of jaquar (continental), parry ware or equivalent make. All sanitary fittings cera/ parry ware or equivalent make. Concealed copper wiring in conduits for lights, fans, power plugs where ever necessary of finecab or equivalent make. Power outlets for geyser & exhaust fans. Power plugs points for chimney, refrigerator, micro oven, mixer & grinder etc., Plug points for t.v & audio system etc., where ever necessary. 3 phase supply for each unit and individual meter board. All electrical switches are modular switches of reputed make. Miniature circuit breaker (m.c.b) for each distribution board of mds or equivalent make. 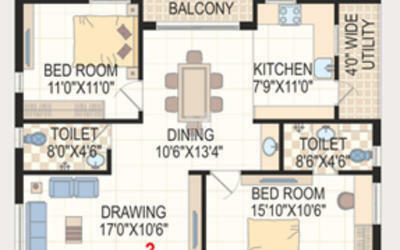 Provision for telephone & t.v points in master bed & living rooms. Intercom facility in all units connecting to security. Internet provision in one bed room only.